‘Ηeteropolitics’ (ERC COG 2017 – 2020) is a research project on alternative forms of political self-organization at the grassroots and the local level, mainly. It discusses and partly compares processes of alternative politics around participatory democracy and the commons in Spain, Italy and Greece. The aim is to acquire, from different perspectives, a broad and nuanced understanding of messy, contradictory but also promising new modes of civic engagement, institutional participation and administration on the city level, examining the extent to which they can help catalyse wider processes of democratic transformation. The aims and the perspective of the research are not narrowly academic. Our intention is to gather and disseminate knowledge on democratic social transformation, civic politics and initiatives and the commons in the three countries, in the hope of boosting activities of socio-political and economic democratic change in the Mediterranean South and more broadly. 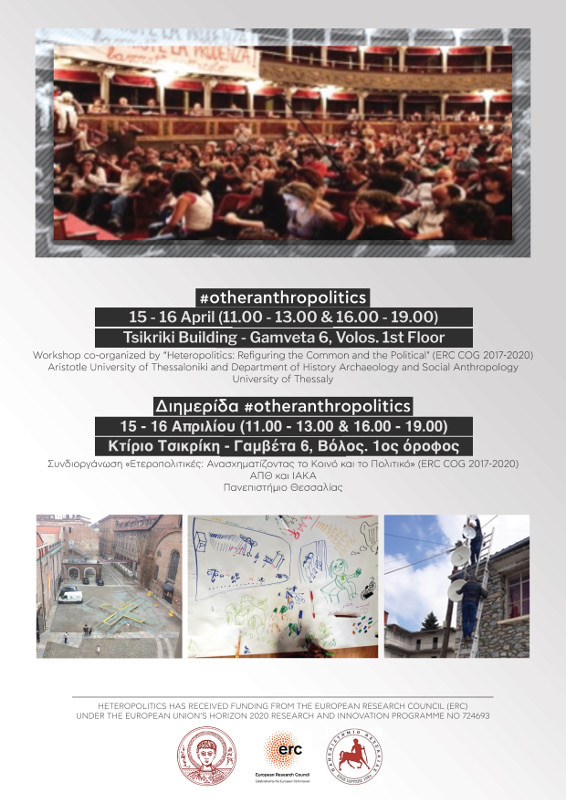 In this context, we are organising an international workshop of the project entitled #otheranthrpolitics to be held in Volos on 15th – 16th of April. The event is co-organized and hosted by the Department of History, Archaeology and Social Anthropology at the University of Thessaly with the participation of researchers and volunteering and institutional activists.